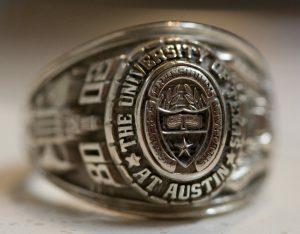 You are holding on to a class ring from 20 years ago and wondering how much it is worth. Class rings are typically containing some precious metal, usually gold or silver. The content of the precious metal determines the value of the ring. The buyer will pay based on what he can calculate is the weight of gold or silver in the ring. Class rings are typically 10K gold, the higher quality ones are 14K gold. Items with gold are usually stamped with a number for example 10K. The K stands for Karat which is the standard for measuring gold purity. Pure gold is 24 Karats or 24K. To get the percentage of gold in an item divide the number before the K by 24. For example 18K will be 18/24=75. This is denoted in decimals of thousand per part so 75% purity is .750. Gold is usually purchased at spot prices that are set by gold markets daily. You can check out the spot price on the internet with a simple search of ‘gold prices today.’ The price is usually given per troy ounce usually denoted as ozt. One troy ounce is 31.1 grams. Your ring’s worth will be assessed based on the weight of gold in it. If you have a 10K class ring weighing 20 grams, the weight of gold in it will be 0.41666×20= 8.3332 grams. Assuming the spot price for the day is $1500/ozt. To get the price per gram divide 1500/31.1 = $48.2/g. Your ring’s worth is 48.2×8.33 = $401. Buyers usually will give 60-80% of the spot price. Many gold buyers will readily accept your class ring. After ascertaining the purity and weight of gold in the ring, you can negotiate on prices. Different buyers will give different offers according to your negotiation skills and the prevailing gold market.